This ingredient is an unsung hero to balancing oil production, but how much it too much? You may have heard of this ingredient as a supplement to support vitamin B3 deficiency – that or Niacin. More recently, the skincare industry is going mad over the topical treatment of Niacinamide due to its ability to penetrate the stratum corneum – the outer most layer of the skin – while delivering antimicrobial, anti-inflammatory, photo-protective, sebum-reducing, and lightening effects when applied topically. Now that’s more than a few benefits. Bear in mind, these benefits are dependent on the concentration of Niacinamide that is being applied, as well as the bioavailability of the ingredient, which refers to how much of the substance entering circulation is able to have an active effect. It’s a water-soluble vitamin, that includes forms of vitamin B3 for topical treatments include niacinamide, nicotinic acid (also referred to as niacin), and nicotinate esters. Niacinamide is the most commonly used as it’s the most well-studied and regarded as the most efficacious. Other forms, particularly at higher concentrations, can cause flushing, meaning that the skin can form irritation and redness. An important factor to note is that although niacinamide has powerful action, it can be used in formulations at concentrations up to 5%, with a very low incidence of irritation. Anything above that percentage could be irritative and cause redness known as the ‘Niacinamide Flush’. Niacinamide has shown to have a stabilising effect on the skin, reducing what is known as trans-epidermal water loss (TEWL), effectively balancing oils and improving the moisture content in the skin. In ageing skin, topical application of niacinamide improves surface structure, smoothing out wrinkles and inhibiting the process of photocarcinogenesis – the process of sun-induced cancer. It’s possible that niacinamide also demonstrates anti-inflammatory effects in skin conditions such as acne, rosacea and irritations. Using this ingredient as part of your skincare routine is something for anyone to consider, however going in misguided and experiencing adverse effects is something many result in. 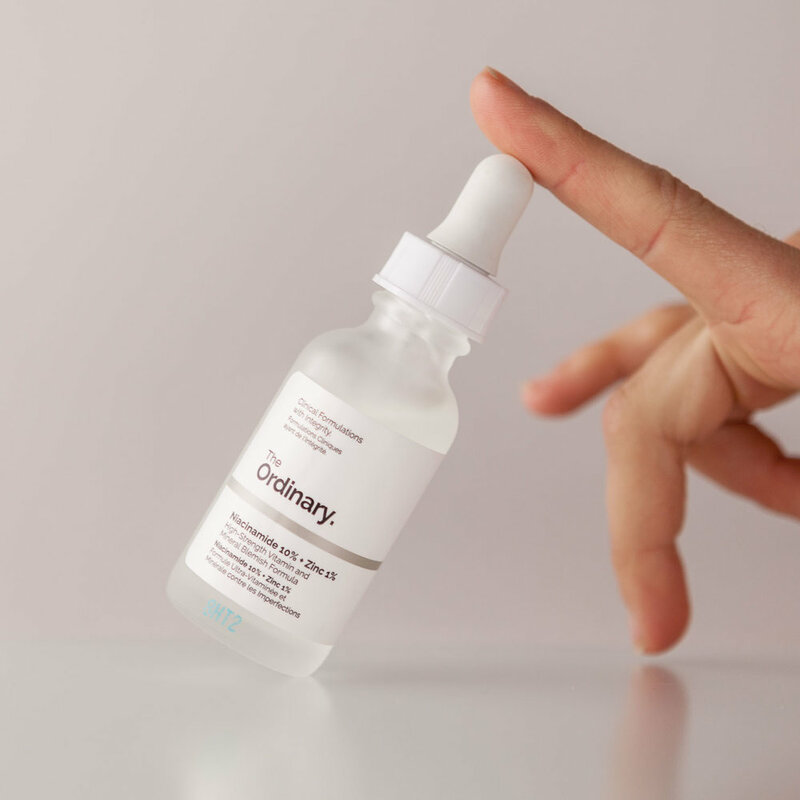 Read our full review on The Ordinary’s 10% Niacinamide + 1% Zinc Serum. It’s important to understand the concentration of this ingredient in your products. Anything above 5% may cause irritations to the skin, even if you aren’t prone to redness or irritation usually. Finding this percentage can be difficult, so look for a product that has it 4th or 5th on the ingredients listing. 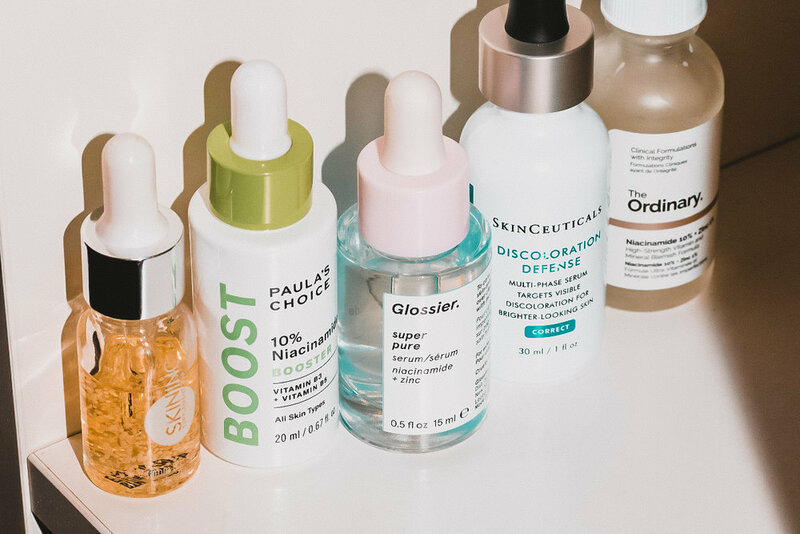 You might see plenty of serums on the shelves marketed at 10% Niacinamide. This concentration, in conjunction with strong acids such as ascorbic acid, will begin to convert Niacinamide into Niacin, however it does depend on the pH of the formula. Although niacinamide is quite stable, in the right conditions it can hydrolyse, and in order to safely use these ingredients together, the right concentrations need to be considered. Another journal article also shown that when the two were used together topically, a 1:1 ratio is formed, reducing both in potency and almost cancelling each other out. Although it’s quite unlikely for hydrolysis to occur when these two products are used in a topical formula, anybody that has AHAs as part of their routine needs to be mindful of their power and interactions. Unless you are being guided by a professional to see how your skin is reacting to this routine, I would advise you not to mix these two ingredients. This goes without saying by now, but if you suffer from sensitivities, avoid this combination altogether, and even reconsider using any form of acid on your skin. Do you use Niacinamide as part of your routine? Did you consider ingredient interactions when shopping for new products? Do you have a good story to tell? — Get involved! We’re always on the lookout for new tales. Contact us here. The Ordinary: Why their one ingredient approach has been so popular, but does it work? A fortnightly edit of our best, direct to your inbox. No spam.